Penniless father, Cyrus Zorba (Donald Woods) inherits his Uncle Dr. Plato Zorba’s mansion. The downside is that old Uncle Zorba had habit of collecting ghosts, and the house currently holds twelve, including a skeleton, a chef, a lion, and a headless lion tamer. Dr. Zorba has also kindly invented special glasses which allow someone to see the ghosts. The family move in and find themselves no only under attack from ghosts but someone in their midst is looking for hidden treasure in the house and happy to kill anyone who gets in their way. 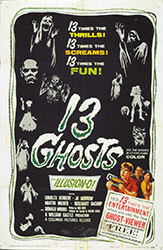 13 Ghosts is a William Castle movie, so it has a gimmick, in this case it’s Illusion-O. Illusion-O is a cardboard ghost with a red lens to look through if you believe in ghosts and blue if you don’t. When the ghosts appear on screen they are red against a blue background, and the trick mostly works but more often renders the ghosts as red blobs. Castle appears at the beginning of the film to explain it and there often help reminders on screen when to take them on and off. The story is fun if never scary, but having a human antagonist in the mix does help keep the movie from just being a series of ghost attacks. Margaret Hamilton shows up as a cheeky nod to her famous role as the Wicked Witch of the West in The Wizard of OZ (1939). 13 Ghosts is a silly trifle meant more to amuse than actually spook.